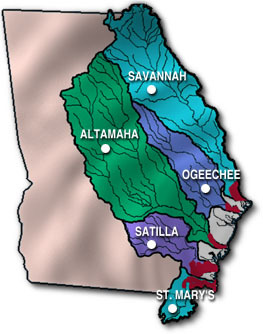 The Georgia Rivers LMER (GARLMER) is one of four projects funded by the National Science Foundation to examine the interactions between coastal wetlands and rivers and their adjacent oceanic ecosystems. The GARLMER project focuses on the transport and transformation of organic and inorganic materials carried from the land into the sea by the five major Georgia coastal rivers confined within a 120 mile segment of the coast. This system offers a unique opportunity for the comparative ecological study of the impact of the land (via the rivers) on the nearshore ocean and of the ocean, through tidal flooding, on the riparian and coastal wetlands. The research is a joint effort of scientists from the University of Georgia Department of Marine Sciences, the Skidaway Institute of Oceanography, the University of Georgia Marine Institute on Sapelo Island, and the University of Georgia Institute of Ecology.